Twas the night before Christmas and up in the sky, stars were gallantly twinkling, when before my eyes; there appeared a sleigh led by an angel, singing heavenly hymns, and at the reign was Our Savior, singing along with him. On the sleigh were presents so beautifully wrapped, with lots of pretty packages scattered over his lap. I grew so excited after seeing this sight, hoping that our Savior would visit me that night. In my mind I couldn't help wonder just what my present might be, hoping all along that he had something special for a good little boy like me. Then shortly after beholding that magnificent sight, I headed for my home that one Christmas night. I jumped in my bed, half covered my head, holding the covers so tight. When all of a sudden out of the window I did see, a sleigh led by a heavenly angel heading straight towards me. I heard this voice so caring so sweet saying, "Gabriel over here, I don't think He's asleep". Then onto the rooftop they landed, and down the chimney our savior came, and from that moment on I promise you, I've never been the same!!! He walked towards me with a smile on his face, so warm and glowing, so full of grace. In his hand was a present that he handed me, but as I took it and opened it, I could clearly see that the package was empty. After seeing my disappointment, and my look of despair, my Savior took me by the hand and assured me that he cared. He said, "my son be not filled with strife, for what I have given you in this box is the gift of "eternal life, and you gained this gift through the death of my son. Now the gates of Heaven are open for you, and everyone". With that he smiled and walked away, and to the chimney he did go, and before too long I heard him say, "Gabriel, come now we must go". Then on to the window I did run, looking once again into the sky, beholding a sight never to be forgotten by me as I said, "Merry Christmas and good bye". Then I turned and walked away with my empty box in hand, knowing that I had been given the greatest of all gifts, for now I could understand. That sometimes the greatest gift we receive cannot be seen nor held so tight, but can only be felt from within one's soul. So won't you open up yours tonight, and welcome Our Savior in? 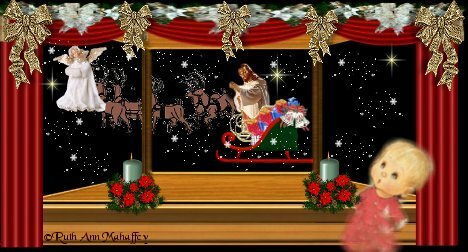 Merry Christmas to all of you, and may your Christmas Season be bright, I give my thanks to each of you for visiting my web site!! !